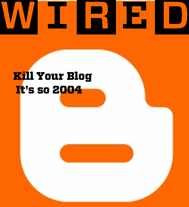 The current issue of Wired Magazine carries some provocative advice for bloggers – shut down your blogs and take refuge in places like Twitter, Flickr or YouTube. The reasoning is that stand-alone bloggers can’t keep up with a team of pro writers, like Engadget or The Huffington Post, who crank out up to 30 posts a day. The article says – "Today, a search for, say, Barack Obama’s latest speech will deliver a Wikipedia page, a Fox News article, and a few entries from professionally run sites like Politico.com. The odds of your clever entry appearing high on the list? Basically zero." The advice published in the Wired story is equivalent to asking mom and pop stores to close shop as there’s a new Wal-Mart store in the neighborhood. True, the competition increases but both entities can still peacefully co-exist and survive well. Twitter is a good place to connect with like-minded people and it definitely replaced the IM client on my machine but nothing more.